Bake a 6 inch, 8 inch and 10 inch round one layer cake each. Place the bottom layer (10 inch) on the cake board and ice it in lavender icing. Place the middle layer (8 inch) on a cardboard cake circle and ice it in pink icing. 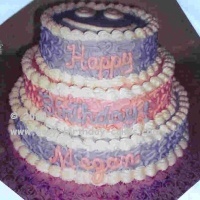 Place the top layer (6 inch) on a cardboard cake circle and ice it in lavender icing. Do the lace work on the sides of the cakes using the same color icing as the cake and round tip size #5. The lace work is done making squiggly lines on the cake surface. On the bottom layer stick four cardboard dowel rods (purchased from a craft store) in the cake and cut off even with the surface of the cake. Pull out and make sure all four dowel pieces are exactly the same measurement. Then push them back into the cake. This is important so the layers will be level. Your next layer will rest on these dowel rods and help support the cake so it will not sink into the layer it is resting on. Place the middle layer on top of the bottom layer and repeat the process with dowel rod on middle layer. Place the top layer on the middle layer. Using white icing and star tip size #18, do the shell border on the top and bottom edges of the side of the cake on each layer. Using pink icing and lavender icing and round tips size #5, write Happy Birthday message on the side of the 3 tiers of the cake. Put lavender icing on the pink cake and pink icing on the lavender cake as shown above. The top is a smiley face made with white icing and star tip size #18. Make sure you see these pages too!